A dense look at the modern history of Turkey, focusing on human conflict and bureaucratic details. 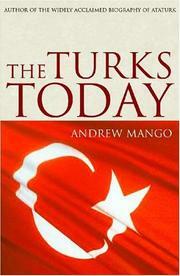 In a sequel to Atatürk (2000), Mango takes up the story of modern Turkey from Atatürk’s demise, necessitating that he address both Turkey’s years of violent tumult and its emergence as a competitive, technologically advanced nation. In his first section, Mango traces several distinct narratives of conflict and compromise from 1938 to the present. The wartime President, Ismet Inönü, skillfully played his country’s interests against both Allies and Axis, continuing a political pattern of Turkey being shepherded by a wily strongman. In the 1950s, ten years of Democrat party rule produced substantial technological and agricultural gains and advanced the government’s ambitious desire for NATO membership, yet also established underlying causes of domestic unrest. In the 1960s and 1970s, Turkey’s growing pains were all too evident: its controversial military occupation of Cyprus was merely the public face of a complicated and bitter civil fight that resulted in numerous assassinations and street killings. Ironically, it took a 1980 military coup that restored law and order “by draconian means” to begin a return to the forward-looking secularism first espoused by Atatürk. In his second section, Mango systematically examines the country’s present achievements in economics and education and the transformations that are still underway in the revered cities of Ankara and Istanbul (the putative centers of government and cultural achievement, respectively). Throughout, Mango seems fascinated by the minutiae, a quality that lends his book the feel of a nation’s lived experience. Still, it’s easy for a reader to get lost among the shifting sands of conspiracy and commerce. Although Mango begins his survey by noting that “The unevenness of modernization and of material progress makes it hard to sum up the state of Turkey today,” it’s clear by the time he concludes that the Turks remain a forward-looking and pragmatic people. A useful historical survey, though arguably more for serious inquirers than tourists.